It's been said that people sing in musicals when mere talking cannot express their thoughts. At least, that's how it's supposed to work. 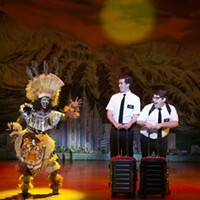 We're only now just emerging from "Broadway: The Lloyd Webber Years," in which characters sang because if they expressed their cartoon-level emotions as dialogue the audience would have slipped into a coma. But in real musicals, people sing about enchanted evenings because words could never fully describe that enchantment. Which is why the 2005 musical of The Color Purple may be the most fitting version of this story by Alice Walker: Its themes are so huge and its emotional landscape so vast that only the glorious sound of soaring voices can bring it to life. Some may disagree -- probably Ms. Walker, for one, and the Pulitzer Prize committee which honored her epistolary novel in 1983 for another. There is the 1985 film version, of course, but more music was the last thing Steven Spielberg's overt sentimentalization needed. 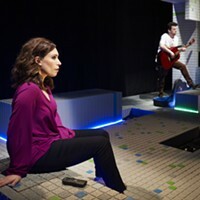 Onstage, it's another matter. Miss Celie begins the story as a black, 14-year-old daughter of a violent, sexually abusive man who marries her off to another violent, sexually abusive man. Celie's life is a misery with only her sister Nettie as comfort. That is, until Shug Avery shows up, a blues singer with a bad rap who teaches Celie how to love and be loved. Celie's journey from darkness into so much light can only, I think, be done justice with music. 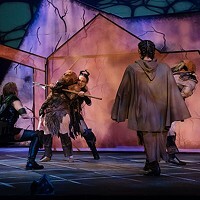 As with any adaptation, playwright Marsha Norma had to choose between either fully fleshing out a few of the book's more important events, or representing them all in a slimmed-down manner. Norman chooses the later, and while her choice is certainly defensible, there is a slight Cliff's Notes feel to the show. Yet these events are powerful enough to provide their own dramatic resonance, helped in no small part by the force of a score by Brenda Russell, Allee Willis and Stephen Bray. And topping it all off is this gorgeously put-together touring version, presented in its local premiere by Pittsburgh CLO and every bit as powerful as the story and the score, with rock-solid performances by this exceptional cast and featuring a truly mesmerizing, achingly beautiful turn from Jeannette Bayardelle who, as Celie, literally stops the show. This Color Purple really sings. The Color Purple continues through Sun., June 15. Benedum Center, 719 Liberty Ave., Downtown. 412-456-6666. 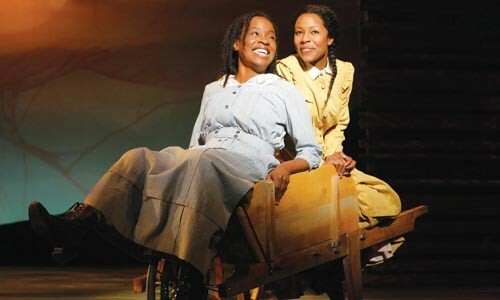 Jeannette Bayardelle (left) and LaToya London in The Color Purple at the Pittsburgh CLO.